When I was a child I remember discovering recipes for invisible ink in a magic tricks book that I had. (Ah, you had a magic tricks book, didn't you?) One recipe involved sugar and water, another used lemon juice, and when you wrote with this special ink recipe you couldn't really see what you were writing. But after the ink dried, and you heated the paper over a light bulb, the secret writing would appear, revealing your message to the world. This is the exact opposite effect we want when choosing a fabric marker for garment construction. We want to see those marks and "notches" (I don't cut notches with sweater knit fabrics; I mark them. ), and we need these marks to be visible all the way through construction. But once we're finished, we want that ink or chalk to magically disappear. Little tools, like the right marker or pattern weight can turn a challenging task into a easy one or make an ordinary project absolutely awesome. Here are some tools that are small in size that I've found invaluable over the past few months. Some of these I've mentioned before. (I've gone ahead and made them affiliate links.) Each is a real project helper or time saver. I used to use good old fashioned waxy tailor's chalk. It's easy to mark a sweater knit fabric with it. The one problem is that the longer it stays on, the harder it is to remove. Even if the marks are on the wrong side of the fabric and in the seam allowance, I don't want the mark to stay forever. Rubbing the mark with flannel will work sometimes, but not always. While Pilot FriXion Ball Erasable Gel Pens make a mark that's really easy to remove on sweater knits (Just iron. ), it's sometimes not so easy to apply on a particularly squishy fabric. Try doing multiple light paint strokes with these pens, instead of pressing down hard, if the fabric is thick. My number one favorite marking tool of the moment is the Vanishing Fabric Marker . With its felt tip, the marks are easy to apply on a sweater knit fabric. The best thing, however, is that the marks really do disappear in a couple of days. And the ink can be easily removed with water if you need it to disappear sooner. 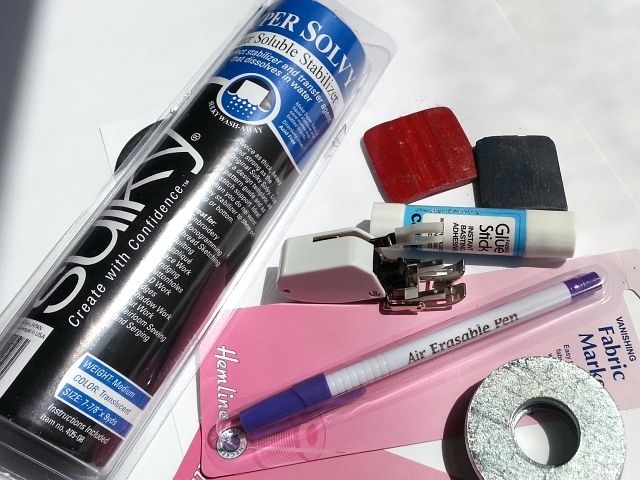 I've already waxed poetic on Sulky Super Solvy Water Soluble Stabilizer in at least one previous post. It's that good at temporarily stabilizing the edges of knits, before you've had the chance to properly finish the raw edges. It's so very helpful when working with cotton or bamboo knits that might run. I haven't really needed it with any of my pure wool fabrics. If you dislike pinning and basting, I recommend Collins Fabric Glue Stick . It's water soluble and works well where basting tape does not, on the uneven surface of a sweater knit fabric. There's nothing wrong with using a needle and thread to baste, but this is fast for matching patterns and very easy to use. 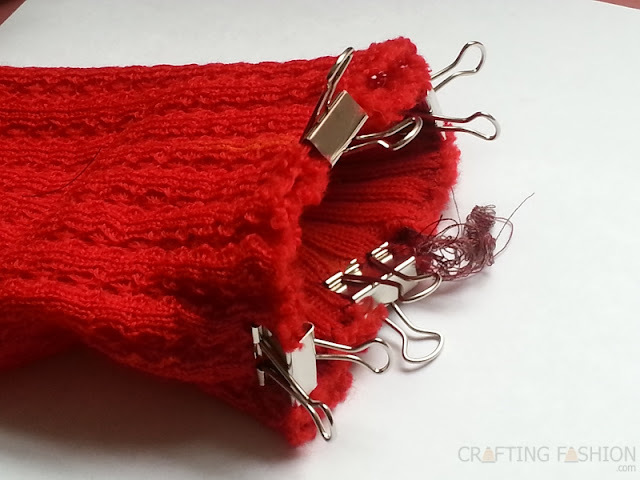 When you just need to hold two pieces of fabric together, but don't really need to baste, try binder clips, as I do when attaching a band to a sleeve or other part of a sweater. You'll never accidentally serge over one of these things. Sometimes it's the little things that can make all the difference. I'd love to hear of any little tools that help you in your projects.